For convenience and security control, Wilson Bohannan padlocks can be keyed to any or all of your door keys. One key works for multiple applications – front door, side door, fence gate, tool crib, meters - you get the idea. Our Key-in-Knob padlocks are compatible with select Arrow™, Corbin™, Kwikset™, Russwin™, Sargent™, Schlage™, Weiser™ and Yale™ Key-in-Knob Cylinders. Available with Lori™ or Schlage™ style drivers and brass or stainless steel cylinder retainers. 29 Wilson Bohannan models available. 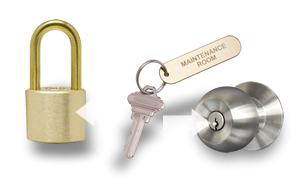 Solid brass and stainless steel construction to prevent rusting and extend padlock life. Weather resistant brass shackles available. Stainless steel and through-hardened stainless steel shackles (exceed ASTM F883-04 standards for cutting) for weather resistance and added security. Available with US-4 Brass or 26-D Chrome finishes. Double ball locking provides highest resistance to pulling or prying. Available key retaining and non-key retaining.